Magnolia & Main: Hey, March! Ever have one of those weeks that goes by super fast and completely disappears and you have no idea what just happened to it? That was definitely this week for me. One minute, it's Sunday and we're busy in the yard tearing out old bushes, raking up the last of the leaves from the fall, and spraying down the weeds and the next thing I know it's Friday. How is already Friday? Heck, how is it already March? I'm still trying to figure out what happened to January and February over here. All of that is to say... oops! The blog took a back seat this week. I'm blaming the beautiful weather outside this week for the week blowing by so quickly. Patrick and I have been enjoying being able to sit outside in our backyard and enjoy a drink at night. & there might have been a happy hour at River Rat on Wednesday when the temperatures reached the mid-80s because c'mon, you can't ignore perfect outdoor brewery drinking weather like that. You just can't. I want to plan a day trip up to Greenville on Saturday afternoon this spring, specifically for some biking along the Swamp Rabbit Trail. Any suggestions for which portions are the best ones to bike along? Anywhere that we need to stop by along the way for food &/or drink? To nobody's surprise, we're still on a major waffle kick. We haven't had waffles every morning but there's been quite a few times that we've started off our day with some. I'm still in disbelief that there are things growing in our yard right now. Partially because it seems too early in the year for things to be blooming but mostly because I usually kill every single plant that I've ever been in charge of. There's a special package on it's way up to Indiana to my two best friends today... & I hope they love how it turned out just as much as I do! Again, apologies for the slacking off that happened on the blog this week. The weather outside has been too pretty to not enjoy and I 100% got distracted by it. Don't worry though, there are plenty of posts headed your way next week including a review of a Columbia brunch spot and one of my very favorite crockpot recipes. 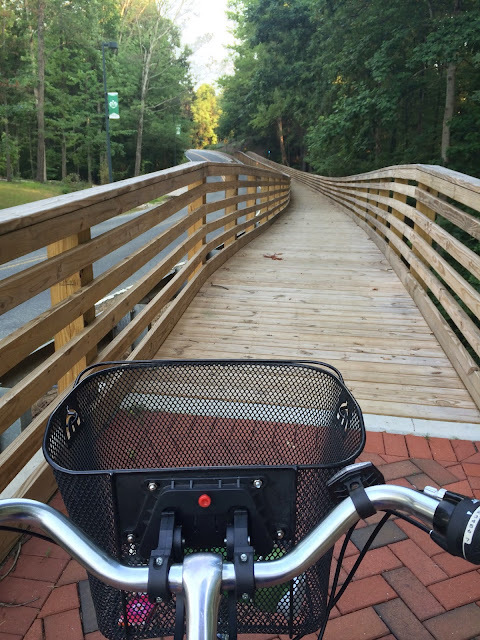 Ride the Swamp Rabbit from downtown Greenville past Furman to Travelers Rest and back. In TR, eat at Williams Hardware (it really is a restaurant!) or Tandem (crepes!). There is also a great little cafe on the trail with wonderful baked goods and fresh produce...you can't go wrong. There's probably nothing better than drinks on your own patio! Happy Weekend! So jealous that you guys can enjoy deck time - that is hands down our favorite thing to do - I'm hoping by the end of March we'll be able to uncover our porch furniture but I know it probably won't be until April - Happy weekend! Glad you're relaxing out back! Everyone needs evening like that. They say this year will be the worst year for allergies since everything is blooming so early. Hope you had a great weekend! I am counting down the days until it's deck time here in Michigan! That bike trail looks awesome.